Beginning piano lessons at age nine, David quickly realized music would be an integral part of his life. At thirteen, he begin working at Duncan FUMC as a janitor and often became distracted when a piano was nearby. He became pianist/organist at Velma United Methodist Church during High School. 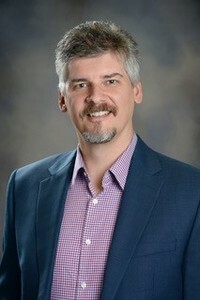 A 1988 graduate of Duncan High School, he graduated from Oklahoma City University in 1993 with a Bachelor of Music degree in Piano Pedagogy after studying over two years to be an organist. He returned to OCU in 1997 to obtain a Master of Music in Vocal Performance (2001). David has over 30 years of full and part-time music ministry experience, has taught voice and piano at Oklahoma Baptist University, and voice, music theory and church music history courses at Southwestern Christian University. He has been the Choir Director at Chickasha High School, music director at Tinker Air Force Base Chapel, among other ministry positions, and has performed at over 3000 weddings and events. He is also a Realtor. David and his wife Brandi were married at Duncan FUMC in 1991 and reside in Washington, OK. Brandi has experience as director of children’s ministries, children’s choirs, religious education, choreographer and event planner. Their daughter, Leigha, is also a vocalist, Miss Oklahoma contestant 2016 and 2018, and is completing a degree in fashion marketing. Andrew, their son, lives in Edmond, is a Realtor and drummer at Quail Springs Baptist Church in OKC. A vital thrust of David’s ministry is encountering God’s presence through worship. He believes worship is an expression of faith, love, gratitude and adoration to our Father in which He finds delight and a place of habitation causing His people to become more like Him.